The Northern Rockies Travel Guide is a resource for those planning a road trip in the region. It is especially useful for road trips running from Mount Rushmore, South Dakota to Yellowstone National Park, Wyoming, and adjoining areas. All the popular attractions are included, such as Mount Rushmore, the Black Hills of South Dakota, Badlands National Park, Yellowstone National Park, and Grand Teton National Park. Many less famous destinations are also included. Details include descriptions, links to many references, travel itineraries, and suggested visit times. Navigating the Guide - Open the Locater Map, or use the Pull-Down Menu, or the Northern Rockies Travel Guide Index at the bottom of the page. While most famous for Mount Rushmore, the Black Hills of South Dakota offers great scenery, great history, geological wonders, abundant wildlife, and excellent outdoor recreation. An oasis of forested mountains on the Great Plains, the Black Hills can be a vacation destination in itself. 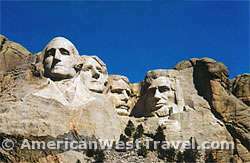 Besides Mount Rushmore, other historic sites include the Crazy Horse Memorial, Minuteman Missile National Historic Site, and the old western mining towns of Deadwood and Lead. The 1880 Train offers a scenic ride on a vintage steam train from Keystone (near Mount Rushmore) to Hill City and back. 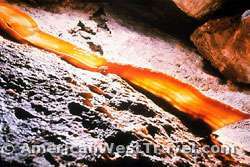 Unusual cave tours are offered at Wind Cave National Parks and Jewel Cave National Monument. Custer State Park has some of the most abundant and visible wildlife to be found anywhere, as well as excellent recreation. The Peter Norbeck Scenic Byway over Iron Mountain is one of America's most unique scenic drives. The Mammoth Site at Hot Springs is one of the country's great paleontology finds and is open to the public. Scenic Badlands National Park is about one hour east of the Black Hills. Visit time: a few days to a week or more. Travel directions: nearest major city is Rapid City, South Dakota, on I-90. Badlands National Park is a wonderland of colorful eroded buttes, pinnacles and spires blended with the country's largest, protected mixed grass prairie. The Badlands Loop Scenic Byway goes through the park, offering easy driving and access to numerous excellent vista points. The best photos can be taken early and late in the day. 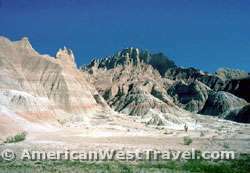 Badlands National Park also contains the world's richest Oligocene epoch fossil beds, dating 23 to 35 million years old. You can see remnants at the Fossil Exhibit Trail (where frequent ranger talks are given) and the Pig Dig. The adjacent town of Wall, South Dakota is the home of Wall Drug, a famous roadside stop for generations of travelers. The one-time drug store and lunch counter is now a combination mini-mall, drug store, restaurant, amusement park, and museum. The museum has an excellent photo gallery documenting the 19th century history of the area. Visit time: convenient to I-90, you can drive through the park in half a day or less. Custer State Park is one of America's largest and most popular state parks, attracting over a million visitors each year. Located where the grasslands of the Great Plains meet the mountainous region of the Black Hills, the park offers a diverse ecosystem rich in wildlife. 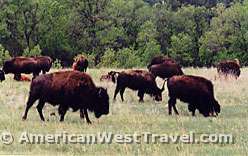 Many people come to see the park's famous buffalo herd in its natural setting. There are numerous well-kept campgrounds, four western-style lodges, spectacular scenic drives, good hiking trails, well-stocked and beautiful fishing lakes, even a playhouse, not to mention events ranging from an annual arts festival to the annual buffalo roundup. Reservations are recommended for camping and lodging. The Sylvan Lake section of the park, higher in the mountains, was especialy impressive, with spectacular scenic drives. Visit time: spend at least a day or two here. One of the most famous landmarks in the United States, Mount Rushmore features the giant likenesses of four presidents sculpted in stone: Washington, Lincoln, Jefferson, and Theodore Roosevelt. The Presidential Trail, opened a few years ago, allows visitors to access the foot of the mountain for the first time and get great closeup views of the sculpture. The original models can be seen at the Sculptor's Studio, a historic 1939 building converted to a museum. The site also features viewing at the Grand View Terrace and the Avenue of the Flags, which features the flag of each state. Dining, gifts and snacks are available. Visit time: two hours. The Crazy Horse Memorial is nearby and a worthwhile stop. The colossal statue of Chief Crazy Horse has been under construction for over 50 years. When completed, it will dwarf the Mount Rushmore sculptures. Jewel Cave National Monument is a complex, pristine cave system believed to be the third longest in the world with more than 133 miles surveyed. Cave tours provide opportunities for viewing the cave and its wide variety of speleothems including stalactites, stalagmites, draperies, frostwork, flowstone, boxwork and hydromagnesite balloons. (At right, an example of translucent "cave bacon".) Various tours are offered, ranging from easy scenic tours to a very strenuous spelunking tour. Visit time: a few hours. Wind Cave National Park is well known for its boxwork, an unusual cave formation composed of thin calcite fins resembling honeycombs. Various tours are offered, ranging from easy to strenuous. The most popular is the nonstrenuous Candlelight Tour, and reservations are suggested. Above ground, the park's land consists of rare mixed-grass prairie which attracts grazing wildlife such as buffalo and proghorn. At the junction of SD-87 and US-385, there is a very large and active prairie dog village on the northwest corner. The park has a campground and nice picnic areas. Visit time: a few hours. The three great national parks of the northern Rockies are Grand Teton, Yellowstone, and Glacier. These parks highlight the northern Rockies. Refer to the article for travel directions.